New Delhi: India’s largest low-fare carrier, IndiGo, posted an 18% jump in profit in the year ended March, performing better than many of its rivals, all of which except one made losses during the period. IndiGo, owned by InterGlobe Aviation Pvt. Ltd, said in its annual filing to the Directorate General of Civil Aviation that profit rose to Rs650 crore from Rs551 crore, marking a third straight year of profit for the carrier that began operations in 2006. “IndiGo is moving in the right direction. While some of their profit results from sale and leaseback of aircraft, rather than all from operations, they are performing quite well," said Ernest Arvai, president of US-based aviation consultant Arvai Group Inc. “With a record order for Airbus A320neos, they will need to continue to be profitable to finance their growing fleet." Gurgaon-based IndiGo has 231 Airbus aircraft on order for delivery over the next 15 years. In 2010-11, it added 12 A320s, bringing its fleet to 38 in March. The carrier only uses A320s. Most airlines typically sell aircraft they have bought to lessors at the time of delivery and, if the market is on the upswing, make a profit of $3-5 million on a plane. For IndiGo, which ordered its first 100 A320s in 2005, this could mean about $48 million, based on $3 million a plane in revenue from sales and leaseback premium alone. “The reasons for the profits is that we’re keeping our costs very low. We’ve seen a 48% increase in revenue this year," he said. “There are obviously hundreds of items that go into doing that." He said not all of the 12 A320s added to the fleet during the year were on sale and leaseback, and some continued to be on the airline’s books. He declined to specify how many of the 44 aircraft it has currently are on lease. Among rivals, low-fare carrier SpiceJet was the only one that made a profit during the year—Rs101.16 crore, up 64.62%. Market leader Jet Airways (India) Ltd, including JetLite, made a loss of Rs86 crore compared with a year-ago loss of Rs420 crore. Kingfisher Airlines Ltd made a loss of Rs1,027.40 crore compared with a Rs1,647.22 crore year-ago loss. All three firms are listed, IndiGo isn’t. Air India made Rs7,000 crore loss in the same period. IndiGo’s total revenue rose 48% to Rs3,946 crore on expenses of Rs3,229 crore. It hired 1,097 people, including pilots, cabin crew and engineers, averaging a headcount of 94 people per aircraft. The carrier made Rs121 crore in non-operating revenue, potentially from sales and leaseback. The airline was able to protect margins on tickets, figures indicate. IndiGo was able to charge approximately Rs3,508 average airfare from 9.46 million passengers, based on total passenger revenue of Rs3,518 crore. Its closest rival SpiceJet charged an average airfare of Rs3,409 during the year, according to the airline. IndiGo’s growth will continue to be stable in the short term before plateauing out, Arvai said. “The challenges for Indigo for 2012 are growth-related—can they absorb the new aircraft on order and grow profitably with new frequencies and new regional destinations served by their A320 fleet?" he said. “At some point, growth provides diminishing returns, but IndiGo appears to be quite some time away from those issues." The carrier, owned by Gurgaon-based Rahul Bhatia and US-based investor Rakesh Gangwal, will add 11 more planes by March. 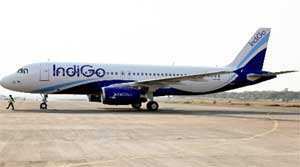 IndiGo will continue to be a largely domestic carrier, Ghosh said. “However, we will be able to deploy 15-18% of our total capacity on international routes by the end of the financial year subject to government approvals." Ghosh said it was too early to comment on how the start of international services will reflect on the balance sheet this fiscal. “Our target is to keep the entire business profitable but it’s early days. There seems to be a fundamental demand on routes where we have commenced our flights," he said. IndiGo began flying to Singapore, Dubai and Bangkok last month.